Wantage Tramway company Engine No. 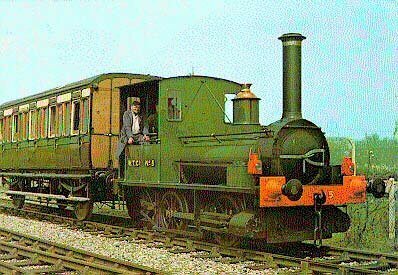 5, known locally as Jane, and now resident at the Great Western Society's Railway Centre in Didcot, is 125 years old this year (1982). 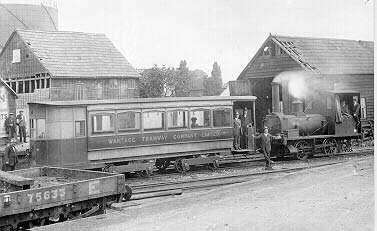 The Wantage Tramway was opened in October 1875 to carry passengers and goods between Wantage and Wantage Road Station on the Great Western Railway, and, except for a short break during the 1939-45 war, was in operation for 70 years. 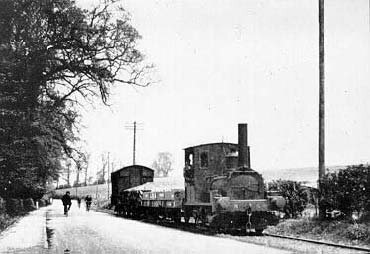 At first, horses were used as motive power, but steam was rapidly introduced and Wantage Tramway became the first in Britain to operate a passenger service by means of steam traction. 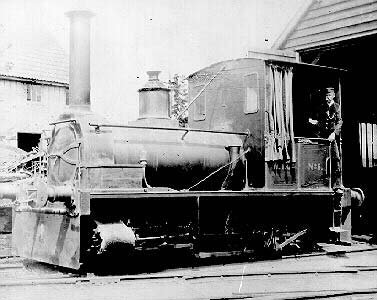 The line was of standard gauge and was thus able to make use of locomotives like the one which eventually became No. 5 on the tramway. 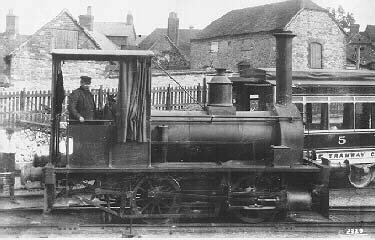 This was a small 0-4-0 well-tank engine dating from 1857 which was built at a cost of £800 by George England & Co. of New Cross, London, for Captain William Peel, R.N., owner of the Sandy and Potton Railway in Bedfordshire. Captain Peel gave his engine the name Shannon, after a frigate which he commanded on a voyage to the Far East in the year when the engine was built. In 1862 his railway was absorbed into the London and North Western Railway, and Shannon was engaged in shunting duties for the latter at Crewe when purchased for the tramway in 1878. Although officially known as Engine No. 5 in the tramway records, the little engine was soon christened Jane by local residents, and many Wantage people know No. 5 by that name to this day. In 1925 the tramway company decided to close its passenger service. This decision was influenced by the introduction of an omnibus service by the Great Western Railway which included the route between Wantage Road and the town. Engine No. 5, and another engine, No. 7, were retained for hauling goods and the tramway quickly assumed the role of a mineral line. The track and the remaining rolling stock gradually deteriorated over the next two decades and the tramway was finally forced to close on 21st December 1945, just over 70 years after the first horse-drawn trip of October 1875. News of the line's closure aroused a great deal of interest among railway enthusiasts and in a letter to The Times, Mr. R. L. P. Jowitt suggested that because of No. 5's long service to the township, the residents of Wantage should take steps to preserve the engine before it was too late. The letter appeared on 8th April 1946, next to a long leader which indicated that The Times was wholeheartedly in favour of the suggestion. Several letters from readers who supported his idea appeared during the next few days. A short time later, when the tramway's rolling stock was put up for sale, a tender of £100 for No. 5 was accepted from the General Manager of the Great Western Railway who said that the G.W.R. wished to preserve the engine because of the long association between the tramway, the town of Wantage and the railway company. Bearing the name Shannon once more, No. 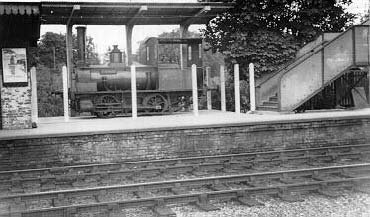 5 was mounted in an enclosure on the down platform of Wantage Road Station in April 1948, and would presumably have stayed there indefinitely had the station not been closed under the Beeching cuts in 1965. Then the fate of the little engine hung in the balance until Wantage Urban District Council agreed to place it on display somewhere in the town. An appeal was made for £2,000 to carry out the job. Meanwhile, the United Kingdom Atomic Energy Authority offered to keep the engine at Wantage Radiation Laboratory and Shannon was taken there in November 1966 on a low-loader supplied by the Amey Construction Company. Here it stayed until 1969, when, the appeal only having produced £10, Shannon was transferred to the recently formed collection of locomotives of the Great Western Society at Didcot. The task of stripping the engine down to investigate its condition began immediately, amid rumours that the firebox was cracked and the boiler beyond repair. Fortunately this did not prove to be the case, and after minor repairs the boiler was satisfactorily tested and Shannon was ready for a trial-run. This took place on 11th October 1969, the little engine performing beautifully and proving itself worthy of all the time and energy spent during the previous nine months. 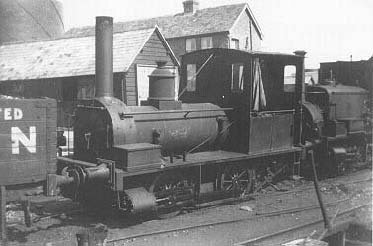 Over the next few years work on renovating the George England engine continued; eventually it was repainted and once again given the number W.T.C. No. 5. During this period No. 5 was in steam on several occasions. On 31st August 1975 the engine was in the Grand Steam Cavalcade to celebrate the 150th anniversary of the Stockton and Darlington Railway. Thirty-five locomotives took part in the run from Shildon to Heightington, Co. Durham, and at the age of 118, No. 5 was the veteran of the show. Now 125 years old, No. 5 is probably the oldest locomotive in the world capable of regular steaming. Lion, although older, is normally on static display at Merseyside County Museum and rarely makes appearances in steam. No. 5 is also the last substantial relic of the Wantage Tramway Company, a concern remembered with affection by older residents of Wantage who still refer to Shannon, alias No. 5, as Jane. 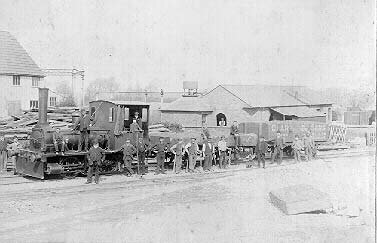 c1890 - staff and work force, with 'Shannon' (Jane) and goods yard train in yard - c 22 men. c1925 - 'Shannon'/'Jane' with car 4 in top yard. c1920 - Oxford Lane - George England engine No.5 ('Jane') with second cars 4 & 3 - 3-4 passengers. Note the second track of passing loop in the background. Wantage Tramway - c1925? 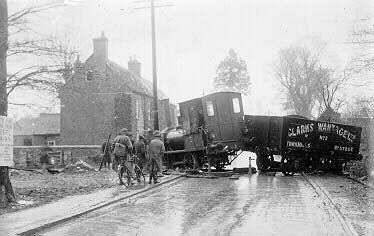 - derailment near bottom yard - engine No.5 across Grove Road with 'Clarks Wantage Ltd' wagon - 5-6 bystanders. 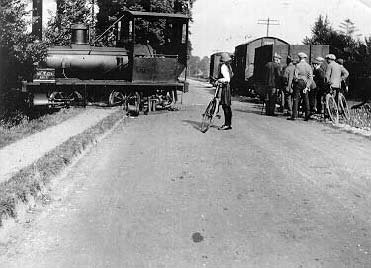 Wantage Tramway - May 1921 - derailment in Oxford road - engine No.5 across road; 6 wagons still on track - 8-10 bystanders + girl with bicycle. background. Note the track construction: longitudinal baulks and cross-ties. 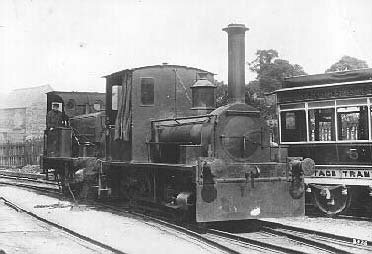 Wantage Tramway - c1900 - Manning-Wardle engine No.7 and George England engine No.5 in Wantage top yard. Car 5 in background. Wantage Tramway - c1900 - George England engine No.5 outside shed in Wantage top yard - Driver Weaving. 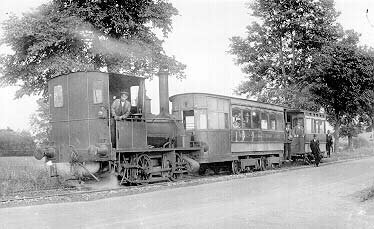 Wantage Tramway - c1920 - George England engine No.5 in Wantage top yard - unknown driver. Car 5 in background. 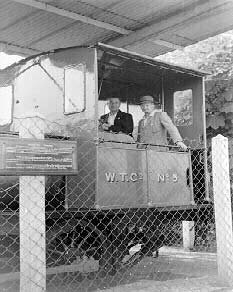 Wantage Tramway - c1930 - George England engine No.5 on 'up goods' at Ten Posts. 3 men on bicycles. 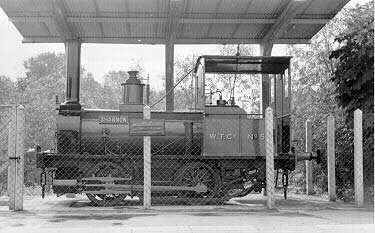 Wantage Tramway - 1948 - George England engine No.5 "Shannon" in shelter on Wantage Road Station platform. Wantage Tramway - 1950s? 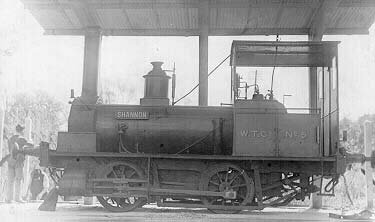 - George England engine No.5 "Shannon" in shelter on Wantage Road Station platform. 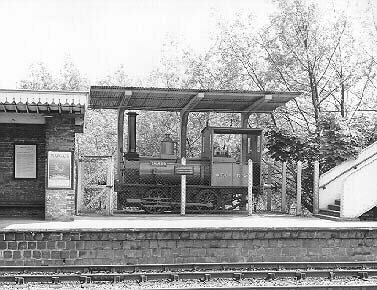 Wantage Tramway - 1957 - George England engine No.5 "Shannon" in shelter on Wantage Road Station platform. Mr Powell, stationmaster (with hat). Wantage Tramway - 1970s? - George England engine No.5 "Shannon" (alias 'Jane') with coach on display track at GWS, Didcot. Restored on behalf of the National Railway Museum by the Great Western Society. 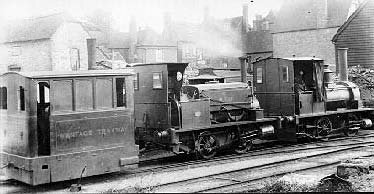 Wantage Tramway - 1932 - George England engine No.5 and Manning-Wardle engine No.7 in Wantage top yard. objects relating to the Vale and Downland area, Wantage, Oxfordshire.